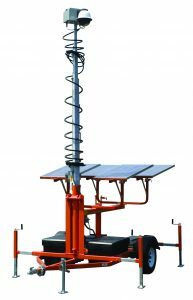 The EzCam provides a portable, self-contained all-weather, trailer-mounted equipment platform. Through the use of wireless communication the EzCam provides the end user a rapidly deployable real-time video system viewable from a remote location. The EzCam can be used as a stand-alone camera system or tied into a large existing CCTV System.